Scarlet fever or scarlatina is an acute, contagious infectious disease caused by an erythrogenic toxin producing strain of Streptococcus pyogenes (group A streptococci) and characterized by a sore throat, fever, a "strawberry" tongue (swollen, red, and bumpy), and a fine sandpaper rash over the upper body that may spread to cover almost the entire body. The name comes from the fact that the skin of the patient is flushed, particularly on the cheeks (Jacobs 2006). Scarlet fever is primarily a childhood disease. If untreated, it can lead to such serious complications as rheumatic fever or glomerulonephritis (kidney inflammation. Thus, although patients generally recover spontaneously from scarlet fever, treatment with antibiotics is normally recommended. Preventive steps for more serious complications include avoiding exposure to those with scarlet fever and, once treatment with antibiotics is started, following the full course of prescribed treatment. Although epidemics were once common, in recent years incidents of scarlet fever have declined, leading to hope that the causal strain of bacteria is actually weakening, as well as reflecting on the human creativity in developing antibiotics. Scarlet fever primarily impacts children between the ages of five and 15 years of age (Jacobs and Carson-Dewitt 2005), and particularly those between four and eight years (Cooper 2005). About ten percent of the children who have strep throat, another childhood disease, develop the characteristic scarlet fever rash (Jacobs and Carson-Dewitt 2005). Scarlet fever is highly contagious, and can be transmitted through the air by sneezing or coughing or by direct physical contact. Within two to five days of exposure to the infection, the symptoms usually begin (Cooper 2005). Within a few days the fever subsides and within two weeks recovery typically is complete. It clears up spontaneously, but antibiotic treatments are typically recommended to speed recovery, reduce risk to others, and prevent complications. Once a person recovers from scarlet fever, immunity is developed and the patient cannot develop the disease again. Severe scarlet fever epidemics were common early in the twentieth century, but the disease became rarely seen as of the early 21st century (Cooper 2005). Antibiotics may be a partial reason for the decline in incidences, but the decline actually began before their widespread use, leading to speculation that the strain of bacteria causing the disease has actually become weaker over time (Cooper 2005; Jacobs and Carson-Dewitt 2005). This disease was also once known as scarlatina (from the Italian scarlattina). Many novels depicting life before the nineteenth century describe scarlet fever as an acute disease being followed by many months spent in convalescence. The convalescence was probably due to complications with rheumatic fever. Prior to an understanding of how streptococcus was spread, it was also not uncommon to destroy or burn the personal effects of a person afflicted with scarlet fever to prevent transmission to other people. In isolated cases, some have contracted Scarlet Fever more than once. A strain of Streptococcus pyogenes is responsible for scarlet fever. 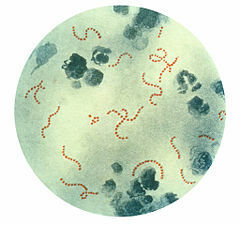 Streptococcus pyogenes is a spherical gram-positive bacteria that grows in long chains (Ryan and Ray 2004) and is the cause of Group A streptococcal infections (GAS). S. pyogenes displays group A antigen on its cell wall and beta-hemolysis when cultured on blood agar plate. S. pyogenes typically produces large zones of beta-hemolysis, the complete disruption of erythrocytes (red blood cells) and the release of hemoglobin, and it is therefore called Group A (beta-hemolytic) Streptococcus. Being classified as hemolytic bacteria means that they have the ability to destroy red blood cells. Streptococci are catalase-negative. S. pyogenes is the cause of many important human diseases ranging from mild superficial skin infections to life-threatening systemic diseases. Infections typically begin in the throat or skin. Besides scarlet fever, other examples of S. pyogenes infections include such mild cases as pharyngitis ("strep throat") and localized skin infection ("impetigo"). Erysipelas and cellulitis are characterized by multiplication and lateral spread of S. pyogenes in deep layers of the skin. S. pyogenes invasion and multiplication in the fascia can lead to necrotizing fasciitis, a potentially life-threatening condition requiring surgical treatment. Infections due to certain strains of S. pyogenes can be associated with the release of bacterial toxins. The strain of S. pyrogens that causes scarlet fever produces an erythrogenic toxin, which causes the skin to flush. Other toxigenic S. pyogenes infections may lead to streptococcal toxic shock syndrome, which can be life-threatening. The "slapped cheeks" and "white mustache" of scarlet fever. Tongue with a strawberry appearance. Punctate red macules on the hard and soft palate and uvula (ie, Forchheimer spots). The chief diagnostic signs are the characteristic rash, which is absent from the palms and soles of the feet, and the presence of the strawberry tongue in children (which is rarely seen in adults) (Jacobs and Carson-Dewitt 2005). The fever usually fades in a few days and then rash begins to fade three to four days after onset and desquamation (peeling) begins. There is flaking on the face and body, while the skin on the palms of the hands and sole of the feet peel more dramatically (Jacobs 2006). The peeling typically begins with the face and then the peeling from the palm and around the fingers about a week later can last up to a month (Dyne and McCartan 2005). Peeling also occurs in the groin, axilla, and the tips of the toes and fingers (Balentine and Kessler 2006). Diagnosis begins with observation of the symptoms. Measles also shows a rash and fever, but in scarlet fever there is usually the absence of the severe eye inflammation and runny nose that accompanies measles, and there is the presence of a sore throat in scarlet fever (Jacobs and Carson-Dewitt 2005). A definitive diagnosis requires laboratory tests. The blood tests shows marked leukocytosis with neutrophilia and conservated or increased eosinophils, high ESR and CRP, and elevation of antistreptolysin O titer. Blood culture is rarely positive, but the streptococci can usually be demonstrated in throat culture. The complications of scarlet fever include septic complications due to spread of streptococcus in blood and immune-mediated complications due to an aberrant immune response. Septic complications, today rare, include otitis, sinusitis, streptococcal pneumonia, empyema thoracis, meningitis, and full-blown septicaemia (malignant scarlet fever). Immune complications include acute glomerulonephritis, rheumatic fever, and erythema nodosum. The secondary scarlatinous disease (or secondary malignant syndrome of scarlet fever) included renewed fever, renewed angina, septic ORL complications, and nephritis or rheumatic fever and is seen around the eighteenth day of untreated scarlet fever. Other than the occurrence of the diarrhea, the treatment and course of scarlet fever are no different from those of any strep throat. Although the patient will recover spontaneously, treatment with antibiotics generally is recommended to avoid the serious complications that can ensue. Such treatment also helps to prevent the spread of the disease and to lessen the suffering of the patient. Treatment consists of penicillin (typically orally for 10 days; or a single intramuscular injection of penicillin G), or alternative antibiotics (erythromycin preferably, or amoxicillin, clindamycin, and oral cephalosporins) if the patient has an allergy to penicillin. Although symptoms subside quickly, it is very important to complete the full course of antibiotics to kill the bacteria and prevent rheumatic fever or kidney inflammation. Balentine, J., and D. Kessler. 2006. Scarlet fever. eMedicine. Retrieved March 7, 2006. Dyne, P., and K. McCartan. 2005. Pediatrics, scarlet fever. eMedicine. Retrieved October 19, 2005.
Cooper, A. 2005. "Scarlet fever," In The Gale Encyclopedia of Alternative Medicine. Farmington Hills, Mich: Thomson/Gale. ISBN 0787693960. Jacobs, S. 2006. "Scarlet fever," In The Gale Encyclopedia of Medicine. edited by J. L. Longe. Detroit: Thomson Gale. ISBN 1414403682. Jacobs, S. J., and R. Carson-DeWitt. 2005. "Scarlet fever," In The Gale Encyclopedia of Children's Health: Infancy Through Adolescence. edited by K. M. Krapp and J. Wilson. Detroit: Thomson Gale. ISBN 0787692417. Ryan, K. J., and C. G. Ray. (eds.) 2004. Sherris Medical Microbiology 4th ed. McGraw Hill. ISBN 0838585299. This page was last modified on 24 December 2011, at 09:38.